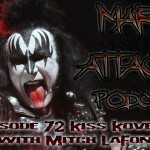 Continuing the My Favorite Kiss series, we are joined by Mitch Lafon of One On One With Mitch, and Chris Czynszak of the Decibel Geek Podcast to discuss some of Ace Frehley, Vinnie Vincent and Bruce Kulick greatest Kiss tracks. You’ll also hear plenty of other Kiss talk throughout the episode, and along the way we’ll pick the “definitive” Kiss track to represent each of these great lead guitarists. As with the previous episode in this series, there is a slight glitch in audio during the episode, we apologize in advance, and have tried to recover as much of the original audio as possible. The episode could have been re-recorded but it would lose a lot of the spontaneity you hear during the show. Support the bands you love, and help the show out at the same time. All of the tracks discussed during this episode can be purchased from here. June 4, 2010 marsaries Comments Off on Vote For Overloaded!